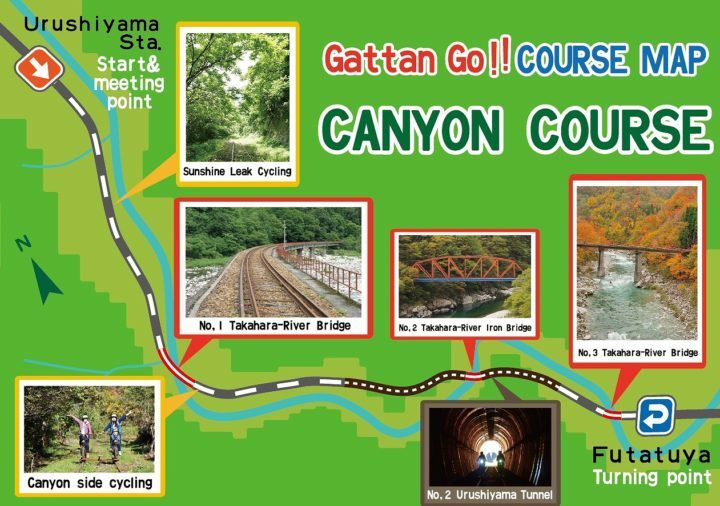 Canyon course – Rail Mountain Bike Gattan Go!! The long-long-awaited new course opens!!! There are large bridges and iron bridges along the course along the Canyon, only the thrill is full marks. It is recommended to adult who is basically full of energy. About 75 mins (for a single line, it is the total time for all bikes to arrive at the station after round-trip. Riding time of each MTB is about 50 to 60 minutes). 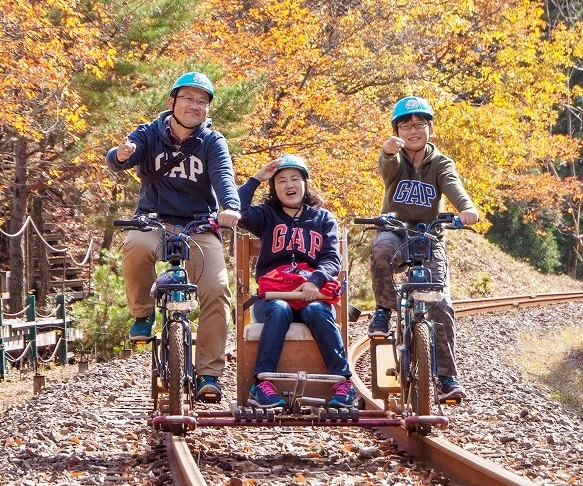 Combination of 3-seater installed wooden “viewing sheet” between 2 bikes. The two ride bikes should be 145 cm or Taller Children in elementary school, please paired with adult always. For the perty of 3 persons. All bikes are for Viewing seat set only in Canyon course. The capacity of the auxiliary seat in the middle is definitely 1 person riding regardless of adult / kids. You can change pedaling person at turning point on the course. Please be sure to observe the following precautions on your safety and make a reservation. Those who are less than 145 cm tall will not bicycle even if their feet reach the bicycle pedals. Please sit down in the middle auxiliary seat. Children of preschool can not join on the Canyon course even if they are auxiliary seat. Can not pedaling a bicycle 1 person. Always pedaling with 2 people. ​primary school student must always make pair with adult​. If the above notes and the group / family composition of reservation content do not match the reservation content, we may refuse to board the day of reservation. Please carefully read the notes and make a reservation. Please be sure to check the mail you receive after booking is completed.